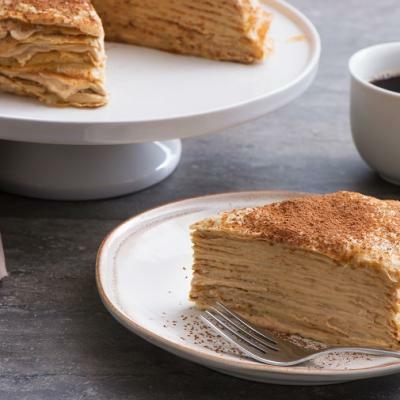 Crêpes, a type of French pancake, are a versatile recipe that can be a base for breakfast, lunch, or the internationally famous dessert dish. Best of all, crêpe batter can be made a day ahead. If using mixer or whisk: Combine eggs and salt in medium bowl. Gradually add flour alternately with milk, beating with electric mixer or whisking until smooth. Beat or whisk in oil. If using blender or food processor: Combine eggs, salt, flour, milk and oil in blender or food processor. Process until smooth, about 1 minute. Scrape down sides; process 15 seconds. Refrigerate batter for at least 30 minutes to allow flour to expand and air bubbles to collapse. Batter may thicken during this time. Thin batter, if necessary, by adding a little more milk or water. Spray 8-inch (20 cm) non-stick skillet or crêpe pan with cooking spray. Heat over medium-high heat until water droplets sizzle when sprinkled into skillet. Stir batter. Pour about 3 tbsp (45 mL) batter into skillet all at once. Quickly tilt and rotate skillet to coat bottom with batter. Cook until bottom is slightly browned, about 45 seconds. Turn crêpe over with spatula. Cook for 15 to 30 seconds on second side. Transfer to plate. Repeat with remaining batter. Add more cooking spray to skillet if crêpes start to stick. 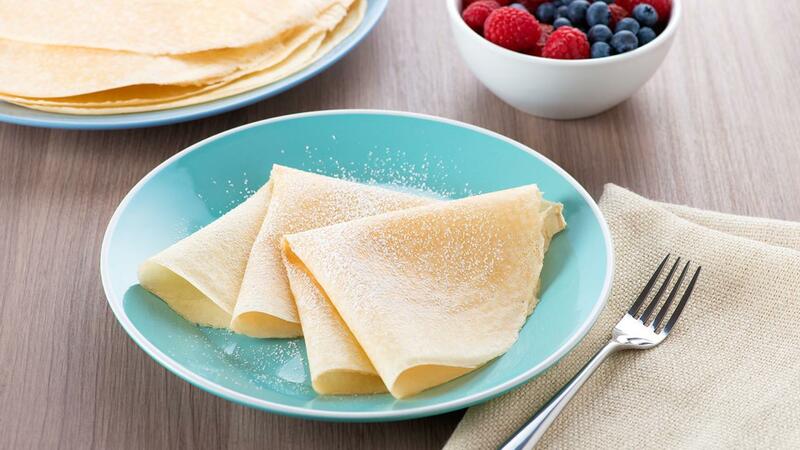 Simple and Sweet: Sprinkle warm crêpe with fresh lemon juice and granulated sugar; roll up. For Kids: Spread crêpe with peanut butter and top with sliced banana or jam; roll up. Fast and Fabulous: Fill crêpe with vanilla ice cream or frozen yogurt; roll up. Top with sweetened chopped fruit or a cooked fruit sauce thickened slightly with cornstarch. 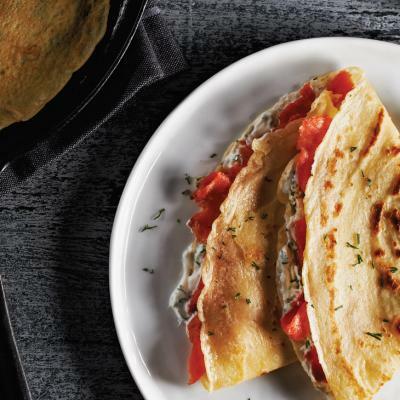 Savoury: Fill crêpe with sautéed chopped ham, red pepper and onion. Sprinkle with shredded Cheddar cheese. Roll up and heat in oven or microwave. Instead of vegetable oil, melted butter can be used. Crêpe batter should be the consistency of heavy cream. To refrigerate cooked crêpes, wrap stacked crêpes well in foil or plastic wrap. Refrigerate for up to 3 days. Let stand at room temperature for an hour before serving. 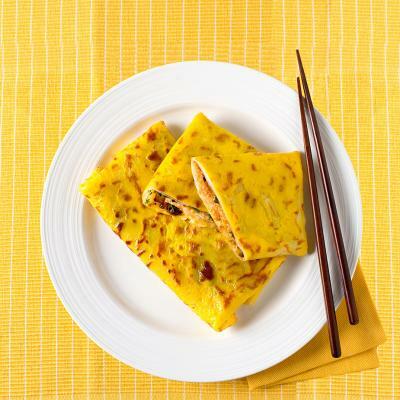 To freeze cooked crêpes, stack, separated with pieces of waxed paper. Place in an airtight container. Freeze up to 4 months. To avoid tearing, thaw crêpes completely before unwrapping and separating. Filled crêpes can be frozen, but since crêpes absorb liquid easily, they may become soggy depending on the filling used. For better results, select a filling which consists of foods that normally freeze well.